As ever more highly specialised beauty products appear on the market, laden with yet more chemicals, our personal care routines become increasingly complex, expensive and even risky! So how can you reduce packaging and clutter, get chemical free, save money, simplify your routines and still have top quality skin and hair? Here are some ideas to get started. Use rhassoul for washing the hair, face and body. It replaces shampoo, conditioner, soap, shower gel and facial cleaners. Washing with clay is exfoliating and it reduces reliance on moisturising. Clay can replace 7 products! Clay is used by hairy mammals in the wild to clean, deodorise and condition the skin and hair and even for humans, there is something deeply pleasurable about washing in clay. As the skin supposedly releases 25% of our toxins, a key benefit of using clay is that it is powerfully detoxifying! In this series you will learn how to observe clay detoxifying the skin. Even if the rest of the skin doesn’t need moisturising, the face, neck and hands do need protection from the elements and from aging. One drop of argan oil removes eye makeup, and a few drops replaces moisturiser for the face, neck and hands. Argan oil is rapidly and fully absorbed, leaving nails strengthened and the skin youthful looking and luminous, protected with a natural SPF. It is also used as a rub in hair conditioner. Being so high in antioxidants, argan oil is a perfect anti-aging oil. One oil, five uses! Commercial deodorants of ammonium alum are not particularly effective. They can be replaced with natural, volcanically formed, potassium alum crystal. Volcanic alum is highly effective and less likely to provoke rashes. The alum kills microbes on the skin. No microbes, no odour. It can be rubbed on insect bites for relief and it is also the original shaver’s styptic for sealing shaving cuts and reducing shaving rashes. Volcanic alum replaces 3 products. Very few shaving products resemble the original exfoliating and shaving soap, a gel-like soap made originally by combining plant oil with lye over a camp fire. This soap gives the closest of shaves and even the razors stay sharper for longer. This soap is also used for a weekly exfoliation – the feet with pumice and the body with an exfoliating glove. In fact, there are hundreds of uses for ‘campfire’ soap. These fully natural resources can be used by the whole family and everything is friendly to sensitive and trouble-prone skins. In the meantime you will find information and products on www.naturalspasupplies.co.uk. Please call 01603 474516 if you have questions, would like advice or would like to order over the phone. Sally Mittuch BA (Hons) PGCE RM ANM draws on archaeology and anthropology to research, source and supply prehistoric, low-tech and green washing and cleaning resources such as clay, alum and soapnuts. 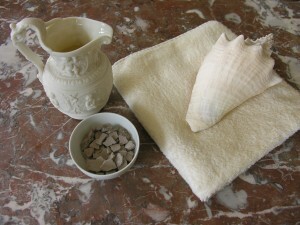 Sally also teaches courses to holistic practitioners on clay treatments for humans and animals. This entry was posted in Beauty, Children, Health & Fitness, Men and tagged bodycare, clear skin, Natural Spa Supplies Ltd, shaving, skincare. Bookmark the permalink.